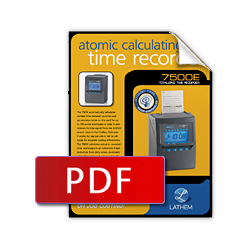 7500E electronic time clock provides precise and exact atomic time and automatically calculates worked time between punches and accumulates totals on the card for up to 100 active employees or jobs. You can choose to automatically calculate actual or rounded time, and set the time clock to support automatic break deductions from daily totals. 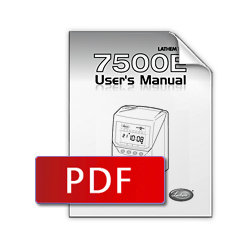 Automatic Daylight Savings Time adjustment and an internal lithium battery maintains the time, card totals, and program settings for up to 3 years without power making the 7500E employee time clock virtually maintenance free.